The Dalmatian pelican (Pelecanus crispus) is among world’s heaviest flying bird species. It measures 160 to 183 cm (5 ft 3 in to 6 ft 0 in) in length, 7.25–15 kg (16.0–33.1 lb) in weight and 290–345 cm (9 ft 6 in–11 ft 4 in) in wingspan. It breeds from southeastern Europe to India and China. Andean condor (Vultur gryphus) can reach a weight of 11 to 15 kg (24 to 33 lb) for males and 8 to 11 kg (18 to 24 lb) for females. Overall length can range from 100 to 130 cm (3 ft 3 in to 4 ft 3 in). It also has a very large wingspan, up to 3.3 m (10 ft 10 in), exceeded only by the wingspans of four seabirds and water birds (the wandering albatross, southern royal albatross, great white pelican and Dalmatian pelican). 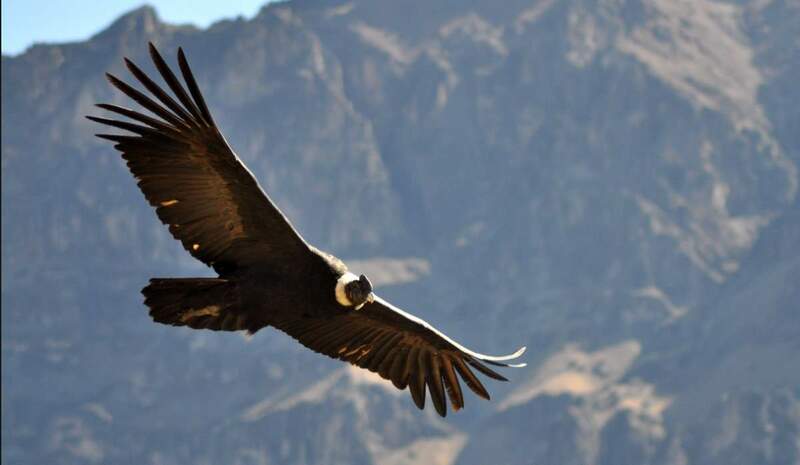 Andean condor plays an important role in the folklore and mythology of the South American Andean regions. It is a national symbol of Argentina, Bolivia, Chile, Colombia, Ecuador, Peru and Venezuelan Andes states. It is the national bird of Bolivia, Chile, Colombia, and Ecuador. Trumpeter swan (Cygnus buccinator) is one the heaviest flying bird species in the world. They are native to North America, and the heaviest birds living in there. They also have a very large wingspan, which can exceed 3 meters (10 feet). The largest known male trumpeter attained a length of 183 cm (6 ft 0 in), a wingspan of 3.1 m (10 ft 2 in) and a weight of 17.2 kg (38 lb). At one point in the history, the trumpeter swan was dragged to near extinction: in the 19th and early 20th centuries, they were hunted heavily. By 1933, fewer than 70 wild trumpeters were known to exist in remote hot springs in or near Yellowstone National Park, and the extinction seemed inevitable. But during an aerial survey of Alaska’s Copper River in the 1950s, several thousand trumpeters were discovered. This population provided critical genetic stock and with careful reintroductions by wildlife agencies, the Trumpeter Swan Society population gradually increased to over 46,000 birds by 2010. The Great bustard (Otis tarda) and Kori bustard are probably the heaviest living flying animal. The Great bustard can be seen in central/south Europa and temperate Asia. But Portugal and Spain now contain about 60% of the world’s Great bustard population. A male Great bustard is typically 90–105 cm (2 ft 11 in–3 ft 5 in) tall, with a length of around 115 cm (3 ft 9 in) and has a 2.1–2.7 m (6 ft 11 in–8 ft 10 in) wingspan. The male can range in weight from 5.8 to 18 kg (13 to 40 lb). Females are much smaller, weighing from 3.1 to 8 kg (6.8 to 17.6 lb). The Kori bustard (Ardeotis kori) is native to Africa. The male kori bustard is 120 to 150 cm (3 ft 11 in to 4 ft 11 in), stands 71–120 cm (2 ft 4 in–3 ft 11 in) tall and may have a wingspan about 230 to 275 cm (7 ft 7 in to 9 ft 0 in). Male birds may typically weigh between 7 and 18 kg (15 and 40 lb). Females weigh an average of 4.8 to 6.1 kg (11 to 13 lb), with a full range of 3 to 7 kg (6.6 to 15.4 lb). 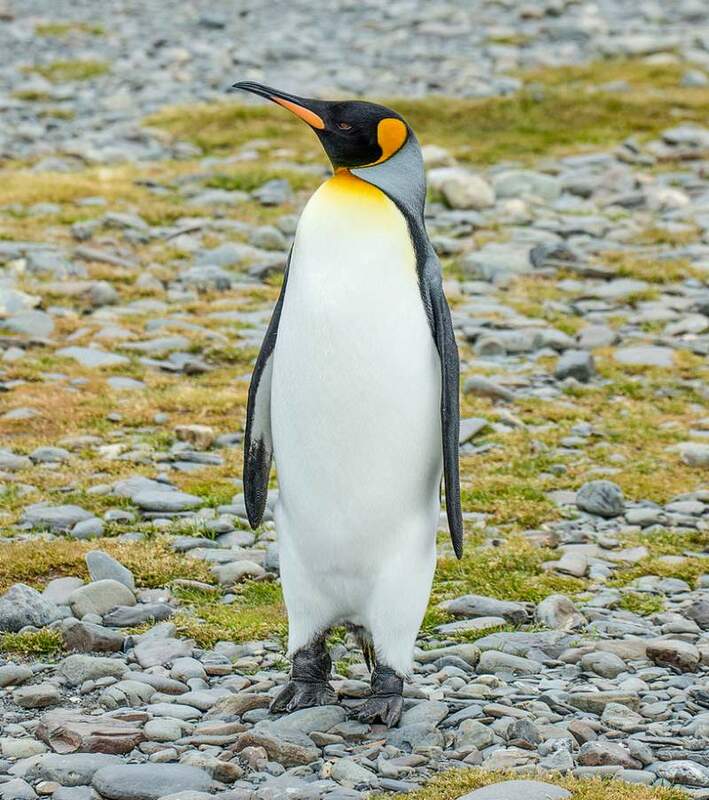 The average weight of the King penguin (Aptenodytes patagonicus) is similar or just slightly higher than that of the largest living flying birds – the Great bustard and the Kori bustard. They stands at 70 to 100 cm (28 to 39 in) tall and weighs from 9.3 to 18 kg (21 to 40 lb). Males are slightly larger than females. It is the second largest species of penguin (the largest is the Emperor penguin). The dwarf cassowary (Casuarius bennetti) is between 99 and 150 cm (3.25 and 4.92 ft) long and weighs between 17.6 and 26 kg (39 and 57 lb). It is distributed throughout mountain forests of New Guinea, New Britain, and Yapen Island, at elevations up to 3,300 m (10,800 ft). Darwin’s rhea (Rhea pennata), also known as the lesser rhea stands at 90 to 100 cm (35–39 in) tall. Length is 92 to 100 cm (36–39 in) and weight is 15 to 28.6 kg (33–63 lb). It is found in the Altiplano (Spanish for “high plain”, the name of Andean Plateau or Bolivian Plateau, in west-central South America, where the Andes are at their widest) and Patagonia in South America. The domesticated turkey (Meleagris gallopavo) was probably domesticated in central Mesoamerica at least 2,000 years ago. The English name, “turkey” is the result of an early misidentification of the bird with an unrelated species which was imported to Europe through the country of Turkey. They can grow up to 39 kg (86 lbs). A greater rhea (Rhea americana) in Tierpark Hellabrunn, Munich, Germany (wikipedia). 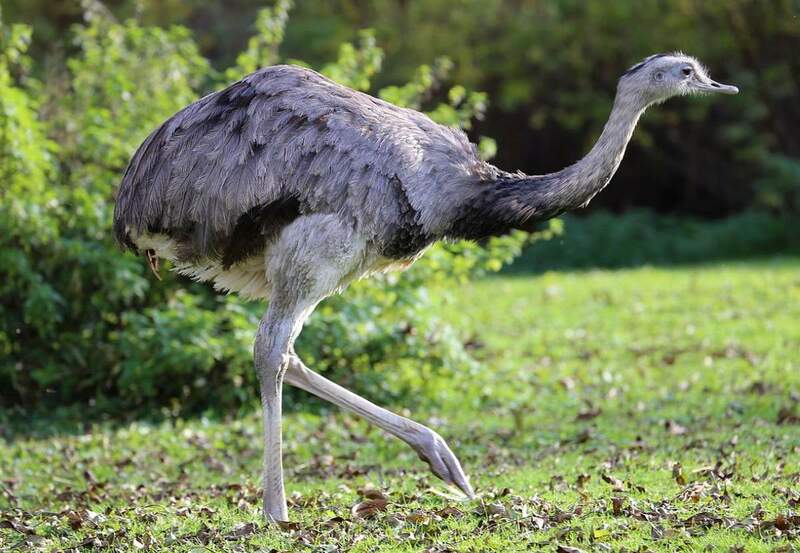 Weighing 20–40 kilograms (44–88 lb), the greater rhea (Rhea americana) is the largest bird on the American continent. Their strong powerful legs allow them to run up to 35 mph (56 km/h). The greater rhea is endemic to Argentina, Bolivia, Brazil, Paraguay and Uruguay. Emperor penguin adults and a juvenile on Snow Hill Island, Antarctica (wikipedia). The emperor penguin (Aptenodytes forsteri) is endemic to Antarctica. Reaching 130 cm (51 in) in height and weighing from 22 to 45 kg (49 to 99 lb), it is the tallest and heaviest of all living penguin species. The male and female emperor penguins are similar in plumage and size. 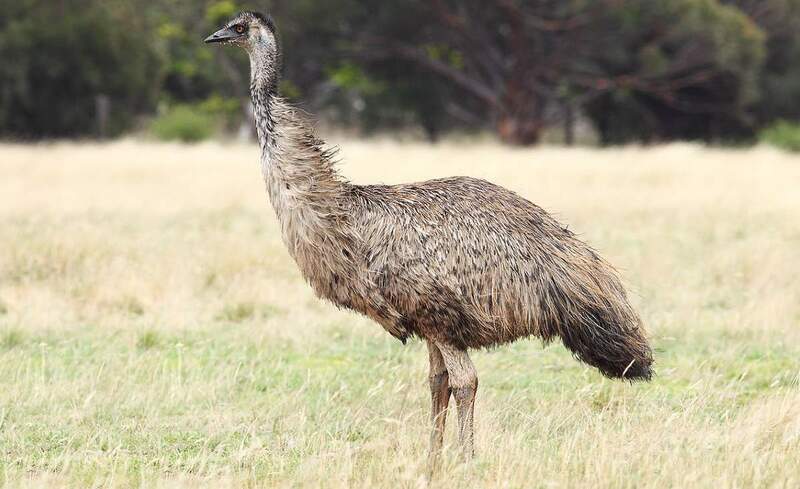 The emu (Dromaius novaehollandiae) is the second-largest living bird by height (the largest one is Emu’s close relative, the ostrich): they can reach up to 1.9 meters (6.2 ft). Emus weigh between 18 and 60 kg (40 and 132 lb). Females are slightly larger than males. They can sprint at speeds of 48 km/h (30 mph). Today, the Emu is endemic to Australia. The Tasmanian emu and King Island emu subspecies became extinct after the European settlement of Australia in 1788. The Northern cassowary (Casuarius unappendiculatus) is a large, bulky bird native to northern New Guinea. Females can weigh up to 70 kg (154 lb), with an average weight of 58 kg (128 lb). Males are smaller. Despite its stocky build, a Northern cassowary can sprint up to 50 kilometers per hour (31 miles per hour). A southern cassowary (Casuarius casuarius), also known as double-wattled cassowary, Australian cassowary or two-wattled cassowary at the Rainforest Habitat Wildlife Sanctuary, Port Douglas, Australia (wikipedia). The southern cassowary (Casuarius casuarius) is distributed in tropical rain forests of Indonesia, New Guinea and northeastern Australia, and it prefers elevations below 1,100 m (3,600 ft) in Australia, and 500 m (1,600 ft) on New Guinea. In general, the bird ranges from 127 to 170 cm (50-67 in) and weighs around 36 to 50 kg (males) and 68 kg (females). The maximum size recorded was 190 cm (75 in) tall and 83 kg (183 lb) weight. Southern cassowary is the largest extant Asian bird (since the extinction of the Arabian ostrich, and previously the moa of New Zealand) and the largest extant Australian bird (though the emu may be slightly taller). A male Somali ostrich (wikipedia). 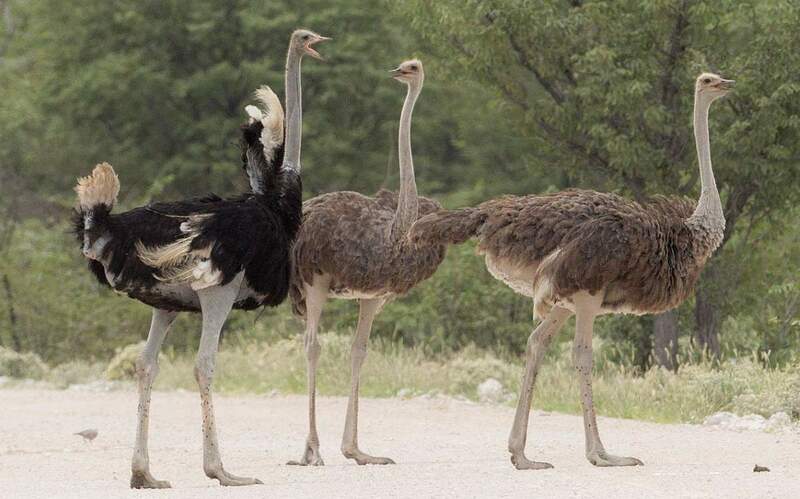 The second largest living bird on Earth, Somali ostrich (Struthio molybdophanes) is a large flightless bird native to the Horn of Africa, especially in north-eastern Ethiopia and across all of Somalia. It was previously considered a subspecies of the common ostrich, but was identified as a distinct species in 2014. A male Somali ostrich can weigh up to 130 kg / 287 lb. Ostrich male (left) and females (wikipedia). The ostrich or common ostrich (Struthio camelus) is the largest living bird on Earth. It is native to Africa. They usually weigh from 63 to 145 kilograms (139–320 lb), or as much as two adult humans. Exceptional male ostriches can weigh up to 156.8 kg (346 lb). Male ostriches can be from 2.1 to 2.8 m (6 ft 11 in to 9 ft 2 in) in height, while female ostriches range from 1.7 to 2.0 m (5 ft 7 in to 6 ft 7 in) tall. Ostriches have large, powerful legs. They can sprint up to 70 km/h (43 mph) and an cover 3 to 5 m (9.8 to 16.4 ft) in a single stride. Measuring from 2.51 to 3.7 m (8 ft 3 in to 12 ft 2 in), Wandering albatross (Diomedea exulans) has the largest wingspan of any bird. Wandering albatross is also one of the most far ranging birds. Some individual wandering albatrosses are known to circumnavigate the Southern Ocean three times (covering more than 120,000 km or 75,000 miles) in one year. The IUCN (International Union for Conservation of Nature) lists the wandering albatross as vulnerable status. The Philippine eagle (Pithecophaga jefferyi) is considered the largest of the extant eagles in the world in terms of length and wing surface. It is typically reported as measuring 86–102 cm (2 ft 10 in–3 ft 4 in) in total length. It also has a wingspan of 184 to 220 cm (6 ft 0 in to 7 ft 3 in). 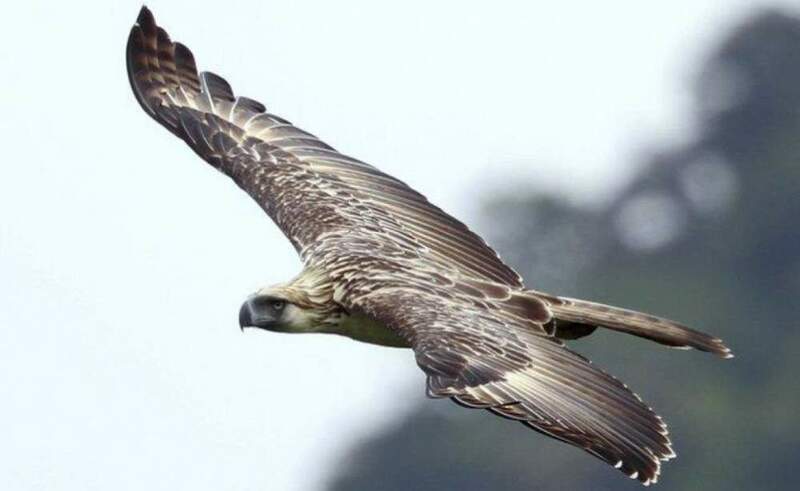 But, in terms of weight and bulk, Steller’s sea eagle (Haliaeetus pelagicus), the Harpy eagle (Harpia harpyja) and the Martial eagle (Polemaetus bellicosus) are bigger than the Philippine eagle. Among condors, which are also considered birds of prey though they are primarily scavengers, the title goes to the Andean condor. Until recently, the Aepyornis maximus, a bird endemic to Madagascar until its extinction about 1000 A.D was regarded as the largest bird of all time. However, in 2018 the largest aepyornithid specimens, weighing up to 730 kilograms (1,600 lb), were moved to the related genus Vorombe. But, in a 2018 study, James Hansford and Samuel Turvey, two researchers from the Zoological Society of London, found that it was sufficiently distinct from Aepyornis and allocated it in the new genus Vorombe. They also recognized Aepyornis ingens as a synonym of Vorombe titan. Vorombe titan weighed 536 to 732 kg (mean: 642.9 kg) and grew up to a height of 10 feet (3 meters) in height. Its name means “big bird” in Malagasy and Greek. 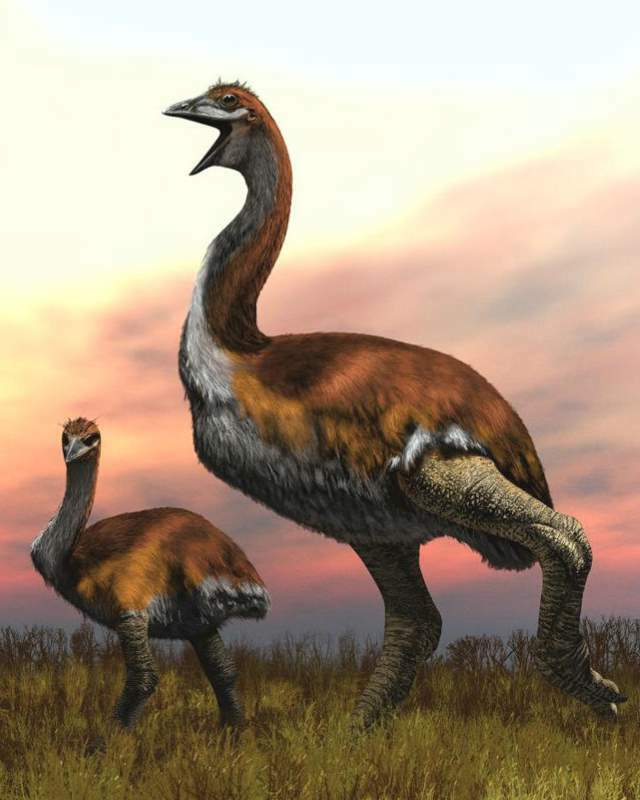 The largest known birds of all time might have been the elephant birds of Madagascar. Of almost the same size was the Australian Dromornis stirtoni. Both were about 3 m (9.8 ft) tall and they have shared the same estimated upper weight, around 500 kg (1,100 lb). Elephant birds were still extant as close as the 17th century. The tallest bird ever was the giant moa (Dinornis maximus) at 3.6 m (12 ft) tall. The largest known flight-capable bird was Pelagornis sandersi, discovered in 1983 in Charleston, South Carolina, during construction for a new airport terminal. It lived 50 million years ago. The largest specimen found in Antarctica, and its wings, fully extended, spanned more than 6.4 meters (21 feet). Pelagornis sandersi probably weighed between 48.5 and 88 lb (22 and 40 kilograms). A replica of a Pelagornis skeleton at the National Museum of Natural History (wikipedia). The heaviest known flying bird ever lived, Argentavis magnificens (“magnificent Argentine bird”, or more literally “magnificent silver bird”), was more than twice Pelagornis’ weight but had a shorter wingspan. It had an estimated wingspan of 5.09-6.07 m (16.7-19.9 ft), a height of circa 1.5-2 m (4.9-6.6 ft), and a mass of approximately 70-72 kg (154-159 lb). The largest known flying animals overall are not birds, but instead the azhdarchid pterosaurs of the Cretaceous (the geologic period and system that spans 79 million years from the end of the Jurassic Period 145 million years ago – mya to the beginning of the Paleogene Period 66 mya). 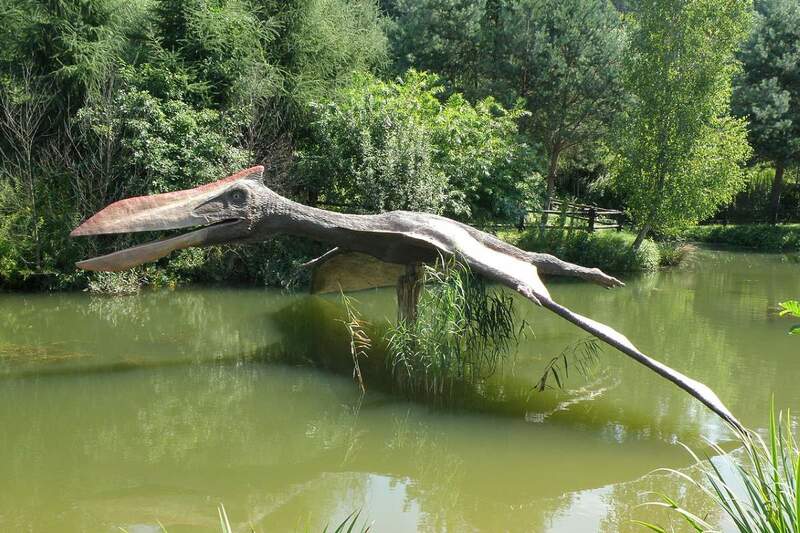 The wingspans of larger azhdarchids, such as Quetzalcoatlus and Hatzegopteryx, have been estimated to exceed 10 m (33 ft), with less conservative estimates being 12 m (39 ft) or more. Mass estimates for these azhdarchids are on the order of 200-250 kg (440-550 lb). Pterosaurs are often mistakenly thought of as dinosaurs. Unlike birds, which are avian dinosaurs, pterosaurs are actually flying reptiles. Quetzalcoatlus northropi is an azhdarchid pterosaur known from the Late Cretaceous of North America (Maastrichtian stage) and one of the largest known flying animals of all time. It is a member of the family Azhdarchidae, a family of advanced toothless pterosaurs with unusually long, stiffened necks. Its name comes from the Mesoamerican feathered serpent god, Quetzalcoatl. Recent estimates based on greater knowledge of azhdarchid proportions place its wingspan at 10-11 meters (33-36 ft). Based on its wingspan, its height would have been at least 3 meters (10 feet). Older sudies give extremely low weight estimates for Quetzalcoatlus, was as low as 70 kilograms (150 lb) for a 10-meter (32-foot-10-inch) individual. A majority of estimates published since the 2000s have been higher, around 200-250 kilograms (440-550 lb). Quetzalcoatlus northropi model next to a 1.8-meter-tall man. Quetzalcoatlus was the largest known flying animal to ever exist.